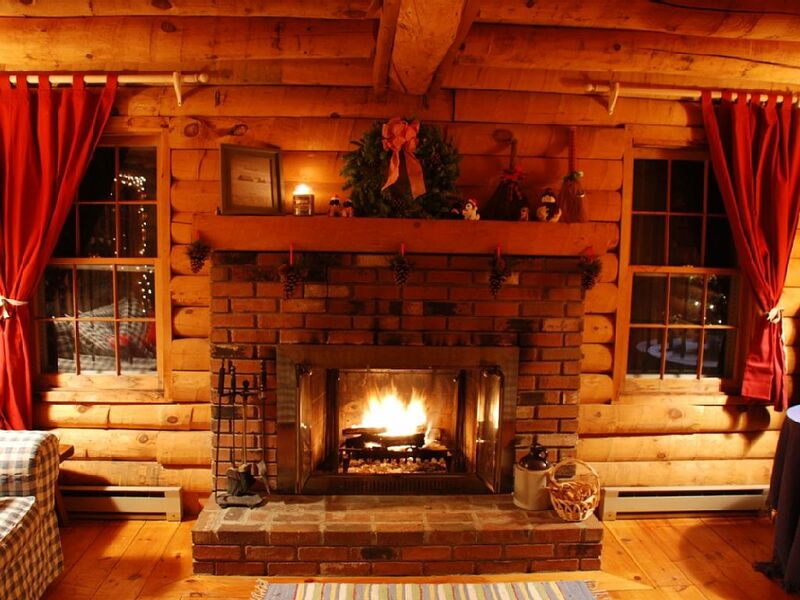 A cabin fireplace brings warmth, ambiance and a general sense of comfort to your log home. 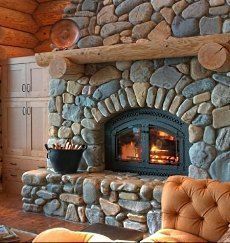 Just what kind of fireplace is best for your log home is dependent upon many factors. Read on to learn about options, features, considerations and more. Most fireplaces purchased today are designed and built by manufacturers in factories, as opposed to being built on site with brick and mortar. Although they might not have that same authentic charm, pre-built fireplaces come in a wide selection and can be easily upgraded. Pre-built fireplaces must be professionally installed and conform to all safety requirements. 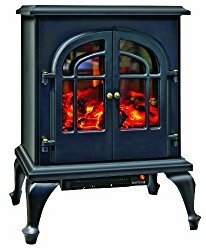 Factory-built fireplaces usually consist of a firebox within a steel cabinet. Quality units are customizable, featuring mantels or surrounds, glass doors and a variety of finishes. Your key decision will be whether to buy a wood burning, gas, or electric fireplace. You'll also need to choose the size and style that best suit your needs. Consider the following information to guide you in your fireplace design planning. 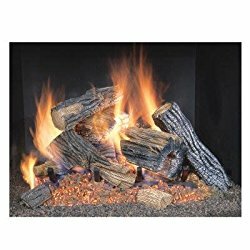 While a wood burning cabin fireplace is unmatched in its traditional beauty and ability to provide the most realistic crackling flame, old style open wood burning fireplaces are pollutants and are banned in some areas as a result. Buying a new fireplace will be less of an environmental battle and more of a testament to your knowledge if you choose a technologically advanced, EPA-certified style wood burning stove option. This will still provide ambiance but add heating efficiency and environmental responsibility. Building and safety permits are required for any fireplace construction, so professional installation is highly recommended. For a wood burning cabin fireplace to function safely and efficiently, proper installation is absolutely imperative. Wood burning fireplaces are significantly more labor intensive than other options. Consider the cost and labor involved in purchasing, splitting and stacking wood. Stocking the fire and clearing ashes are essential maintenance tasks. Harder woods will usually burn longer and help prevent creosote build-up in your flue. Other maintenance requirements include yearly inspection and cleaning by a certified professional. Gas fireplaces are popular options because they light with the flip of a switch, making them far more convenient and labor-friendly than wood burning units. Many gas fireplaces come equipped with remote controls and wall thermostats and all are by nature clean burning and efficient. Choosing between liquid propane and natural gas is entirely your choice but usually depends on what’s available in your area. Gas fireplaces come with either no venting system or a direct vent. Direct vent fireplaces use zero-clearance technology, so they don’t require the presence of a chimney or foundations, as very little space is needed between the unit and combustible materials. Venting is usually through a wall or roof, allowing more placement options and easier installation than wood fireplaces. Direct vents allow combustible gases to leave the home quickly and with little fuss. You should always check with building inspectors for the local codes before installing a vent free fireplace or hearth product, as these can vary by locale. Keep in mind that moisture build-up can cause mold in unvented units, as well. A gas fireplace can be installed wherever a gas line is available, in the center of the room or along a wall. HVAC contractors and licensed plumbers are permitted to run gas lines and it is important to have a licensed professional complete installation so that all safety codes are met. The Hearth, Patio & Barbecue Association (HPBA) suggests annual professional inspections of the burner, venting, fan, pilot light and thermostat of a gas stove. 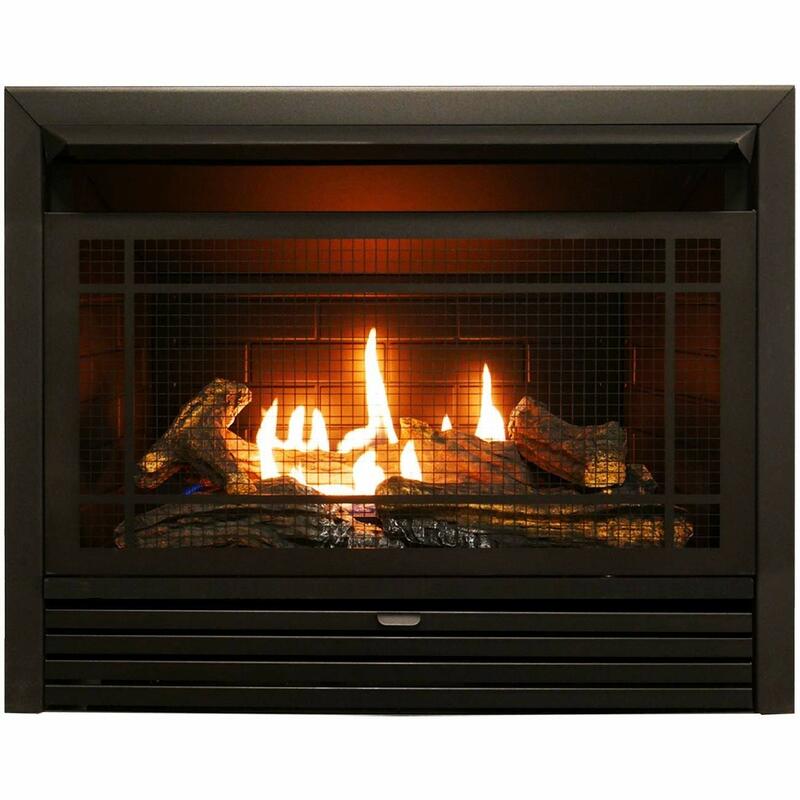 Like a gas fireplace, an electric fireplace will provide ambiance and heating with the flip of a switch. It also costs very little to install. 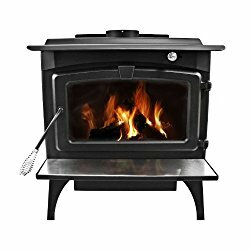 Additionally, venting is not required, so an electric fireplace can be installed almost anywhere an electric outlet is available. Many models allow users to turn on the lights without cranking the heat, a great feature for summer use. Other optional features include thermostats, remote controls and adjustable flames. No invasive installation is required as long as an outlet is available. This fact makes an electric fireplace a great choice for any room, including a bathroom, a bedroom or cabin loft. Virtually no maintenance is required for electric models, making these especially attractive for cabin vacation rentals. Wood burning or gas fireplace inserts fit into old fireplaces and use an existing flue, sometimes only after small modifications. Inserts are generally used to update polluting and inefficient open wood burning fireplaces, transforming them into efficient, environmentally sound heat providers. Insert installation depends on style and specifications, but will require less cost than installing an entirely new unit. Professional installation is still recommended, since local and state regulations can apply. Refer to the wood or gas burning section of this guide for your respective insert type. When it comes to convenience, wood fireplaces fall far behind gas and electric models. Flipping a switch or pressing a button will crank up your gas or electric heat source with little effort, but a wood-burning fireplace requires dry wood supplies, lighting and stocking. In older models, it may have been necessary to choose between these two main goals. Today, EPA-certified wood burning fireplaces and other fuel options provide both efficient heat sources and subtle atmospheric enhancements. Choosing a fireplace large or small enough to meet your style and heating needs can be difficult. If they come into conflict, prioritize: choose heat if that’s your main objective. Regardless of whether a cabin fireplace is wood or gas burning or electric, style varies greatly. The material and style of the fireplace mantel or surround and the glass doors will greatly affect the fireplace’s overall appearance and relationship to the room. The mantel and surround may be purchased separately from the unit itself. The unit’s interior will also influence its appearance. Consider your aesthetic goals: Are you trying to create a clean, sophisticated look, or a rustic, comfortable feel? Reputable manufacturers will inform you of the necessary size fireplace to heat your space efficiently and experienced subcontractors may help you choose the right size, especially if you are replacing an existing unit. High ceilings, number and use of efficient cabin windows, insulation and total square footage play a large part in heating efficiency. A high quality fireplace will be solidly constructed from materials like stone, brick and marble. Overall strength, heavy-duty faces and an EPA certification are important for durability and safety. Flame quality in gas and electric units can be an indication of sound workmanship. Top of the line fireplaces may include ceramic glass doors in brass frames, stainless steel construction or heavy-duty steel grates. Features included for efficiency, like heavy-duty doors, gas log sets and blowing fans, are common in high quality fireplaces. Fireplace costs vary greatly based on fuel choice, performance, material quality and size. Similarly, installation costs range from very low (as with electric fireplaces, which negate any installation costs, and inserts, which require simple installation), to high (for gas or wood burning fireplaces). The costs of operating a fireplace can be difficult to quantify since they are relative to energy costs in your area, the availability of wood and your log home’s insulation and energy efficiency. If wood is readily and cheaply available, wood burning fireplaces can be the least expensive to operate. 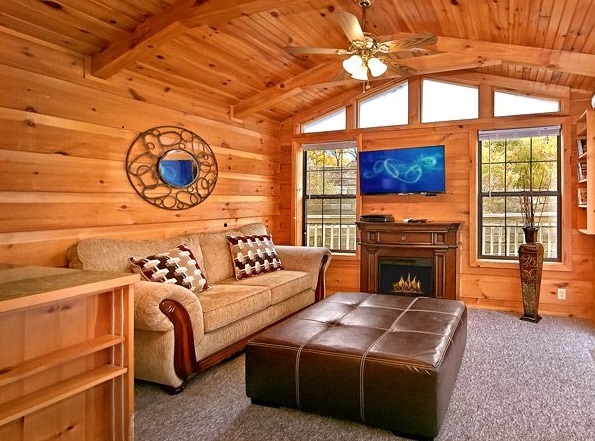 Purchasing a new cabin fireplace is a large undertaking. First and most importantly, check your local standards. If you choose to go the traditional route, you’ll be sitting happily by an authentic, crackling wood fire. If you choose a more modern electric model, you can turn on the ambiance but ditch the heat in the summer. Whatever your final decision might turn out to be, ensure it’s the right one by carefully assessing factors like style, size, cost, convenience and of course, safety.